Syrian President Bashar al-Assad, who is facing increased pressure from world leaders to step down, became Anonymous' latest target after the hacktivist group leaked his email account and reveled his password. President al-Assad's emails were among 78 other account details from staff members posted on Pastebin by Anonymous, revealing that many of them used two of the worlds least secure passwords: 12345 and 123456. The hackers, some of whom were based in Israel, used relatively simple hacking methods to gain access to the Syrian mail servers according to a source within Anonymous quoted by Forbes. Among the emails obtained included exchanges between Syrian press attaché at the U.N. Sheherazad Jaafari and Luna Chebel, a former Al Jazeera journalist who now works at Assad’s bureau, discussing tactics ahead of the December interview with Barbara Walters of ABC. Israeli newspaper Haaretz has since published the full content of the email exchange (PDF) on their website. "It is hugely important and worth mentioning that 'mistakes' have been done in the beginning of the crises because we did not have a well-organized 'police force.' American psyche can be easily manipulated when they hear that there are 'mistakes' done and now we are 'fixing it. '," wrote Jaafari in one of the emails. The way US law enforcement has dealt with Wall Street protestors was also mentioned. “It's worth mentioning also what is happening now in Wall Street and the way the demonstrations are been suppressed by policemen, police dogs and beatings […] Syria doesn't have a policy to torture people, unlike the USA, where there are courses and schools that specialize in teaching policemen and officers how to torture," citing Abu Ghraib in Iraq and electrocution by the electric chair as prime examples. These email exchanges give an insight to the contempt shown for international public opinion by the Syrian President's advisors, with one of them stating that the US audience didn’t care about reforms, wouldn’t understand them anyway and had no interest in doing so. 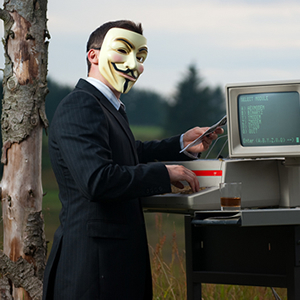 This is not the first time Anonymous has attacked the Syrian regime. Last September they defaced multiple Syrian government websites, following on from hacking the Syrian Defence Ministry the month before.